The TDR Rotrex is for sale. We have sold over 60 kits. Most of them have sold in the USA but we have also sold kits all over the world including Australia, United Kingdom and even Hungary. They have been installed on daily driver Miatas to dedicated track cars and everything in between. 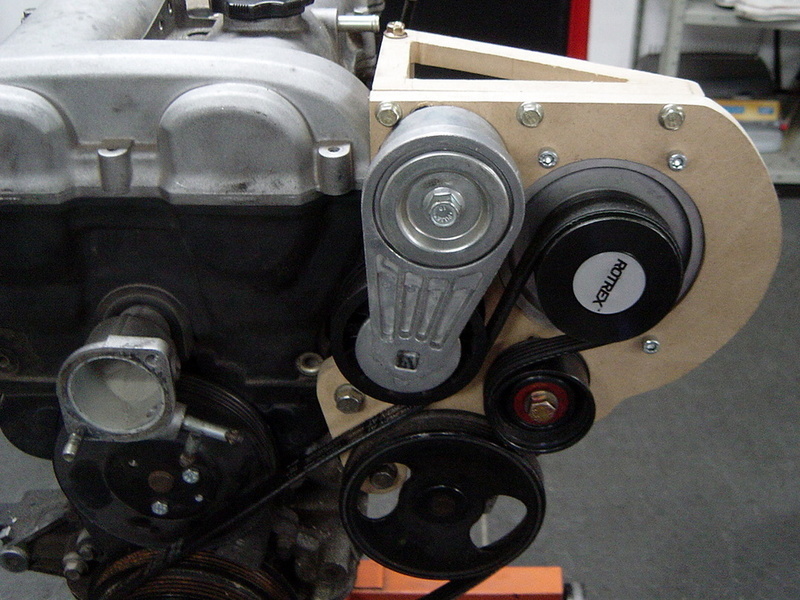 We even have a customer who has installed one on a Lotus 7 replica running a Miata drivetrain. (see below) We can sell you a complete kit or assemble a custom kit to your requirements. Contact us to order. We have not advertised on the website our kit availability as we want to start slow on delivering kits. However, those that contact us by phone or email can order a kit immediately. Here is a quote on a complete TDR Rotrex kit. If you have special needs for your setup, please let us know. We have also added a couple of common items that a lot of our customer purchase at the same time. Shipping takes 1-2 weeks on average. 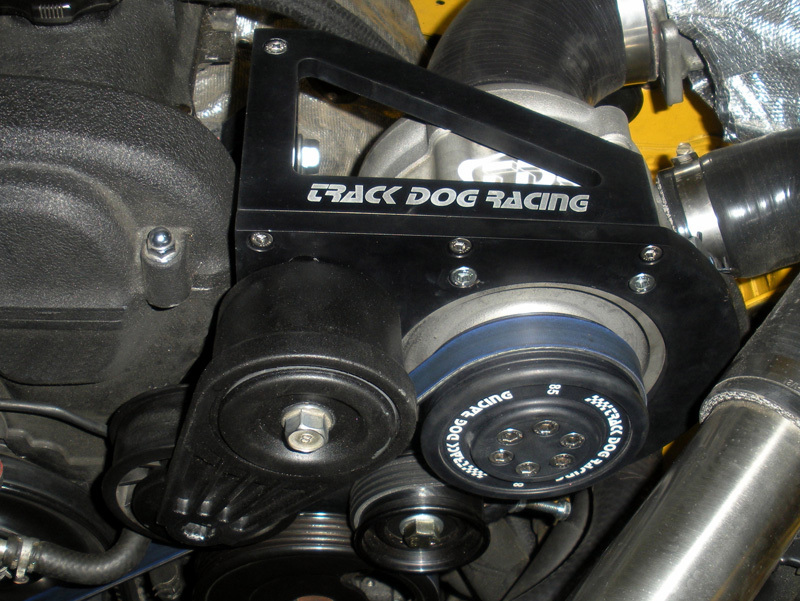 Track Dog Racing STREET Rotrex supercharger kit. Includes the C30-84 supercharger, oil cooler, reservoir, supercharger mount and tensioner, 80 mm SC pulley, intercooler setup, TDR Fuel and Timing Control plug-and-play, upgraded 335 cc fuel injectors, fuel pump and kit, intake kit with silicone hose and K&N filter for MAF setup, BOV and silicone hose setup, catch can, header heat shield, hood struts and comprehensive instructions. We have started shipping a few kits to some of the early adopters that have stayed patient with us over the years of development. We are workling on getting the shipping process down. We have check lists to make sure every nut and bolt is included and we are working on getting the packaging as efficient as possible. While we were getting everything together we realized we ran out of the TDR NB top radiator covers. We've had to go with a new manufacturer on these and so this will sadly be another delay for the NB kits. Maybe 3-4 weeks. Arghhh! 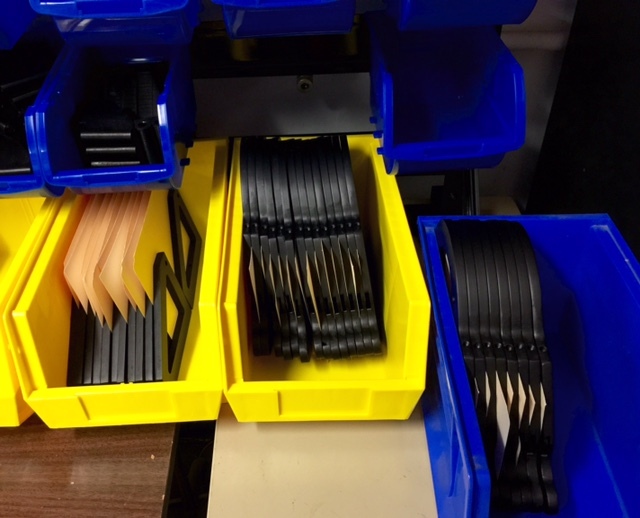 I wanted to provide everyone with a behind the scenes look at some of the work we have been doing to get organized. This is the installation manual for each kit. Full color photos and comes bound like a book. 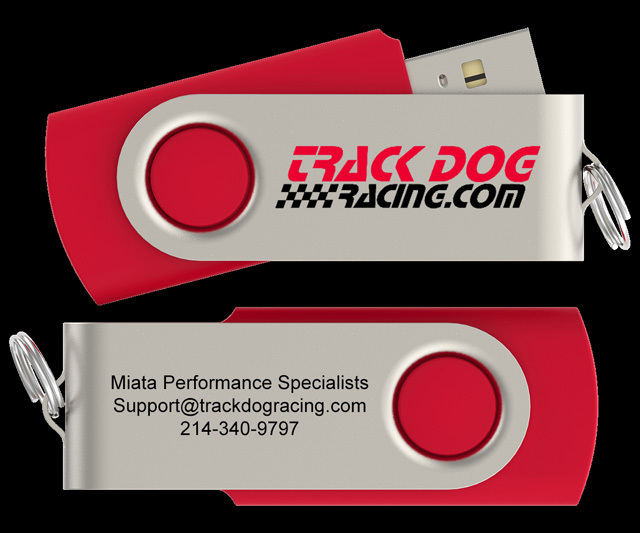 We will also be including a USB drive with pdf files of every page. 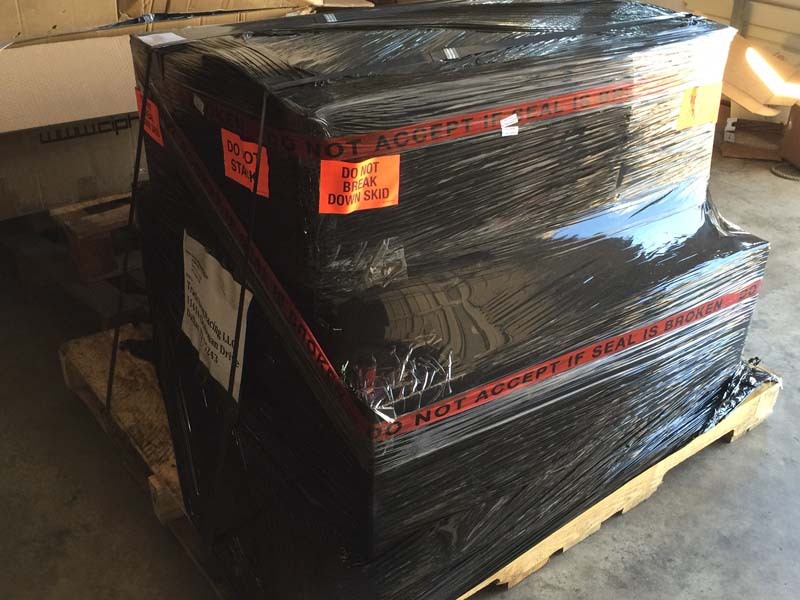 We received a pallet of Rotrex Supercharges the other day. 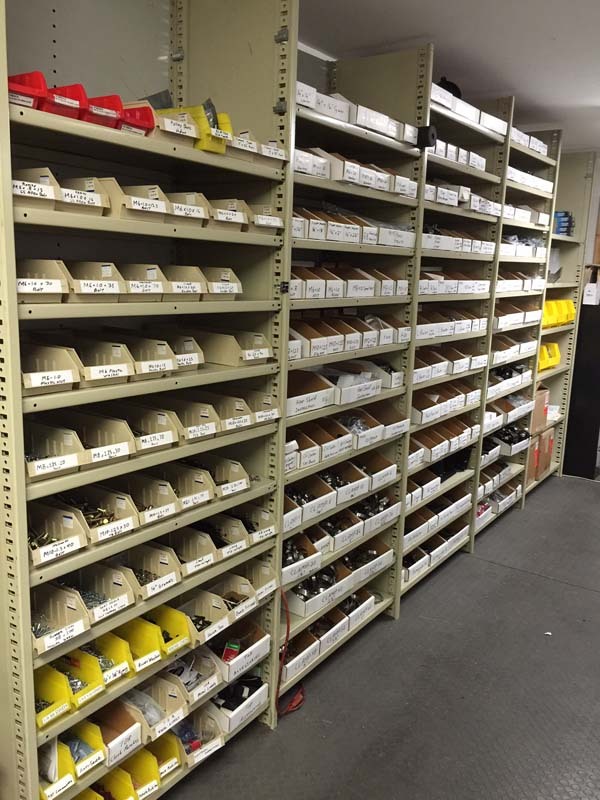 This is the new shelving unit we installed to organize all the parts. Every nut, bolt and bracket has its own bin. We also have some preassembled hardware kits to make it easier to assemble a kit to ship out. Even though its only a few photos, you can see there is a lot going on to make a kit with the level of quality and detail that we wanted Once we get the kit assembly and shipping kinks worked out and we get this kit in a few people's Miatas, I think you will see it was worth the wait. The kit is not on our website yet. We want to make sure we have everything to ship new orders in a timely manner. One of our early adopters, Kent H. is documenting his experience on Miata.net. Check it out. 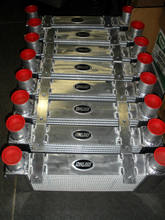 The Complete TDR Rotrex Street Supercharger system will come standard with the following. We will work with customers on custom setups as needed. We will also be offering a track setup for cars with built motors and without A/C and power steering. It uses the folowing in place of the street setup. Pricing for the track setup will be announced at a later date along with dyno charts. We are going to release the 90-97 model first in the next few weeks. We are working on parts inventory and kit component packaging now. We are waiting on a new silicone hose design on the 99-05 model. The NB kit should be ready to ship early spring. We have compiled our dyno charts giving you a good comparison between a ’92, ’96 and a ’99 model using our TDR Rotrex supercharger setups. 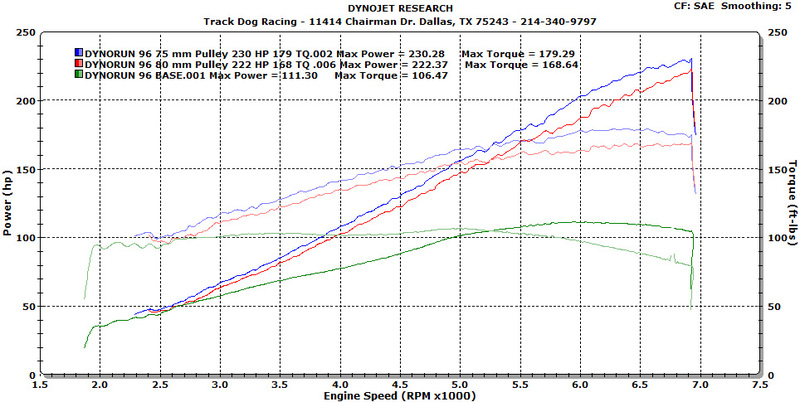 We use the industry standard DynoJet for all of our dyno power information. The power level of your car with a similar setup may be more or less than these charts listed below. All figures in the charts below are not a guarantee, but a suggested output you might see in a similar installation. The first chart we have is from our 1992 sunburst yellow. It has the original motor with 98k miles and has never been opened since Mazda assembled it 23 years ago! Exhaust setup is all Racing Beat including the header, mid-pipe and dual exhaust. The clutch is our Spec Stage 2+ clutch with aluminum flywheel. For fuel management we use the TDR Fuel Card and Deatch Werks 310 injectors on 93 octane pump gas. We did not include separate timing control for the 90-93 model, instead we retard the Cam Angle Sensor (CAS) 3 degree from a base of 10 degrees. For 91 octane customers, we suggest 4 degrees retard. It has a completely functional A/C system and does not have any idle issues compared to the older style supercharger kits. Power delivery is linear, increasing with every RPM all the way to red line. 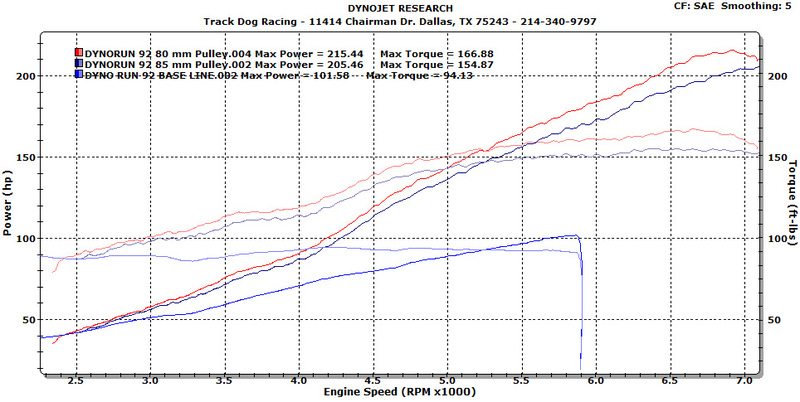 See the nice torque curve on the dyno chart, the power does not drop off. Gauges are from Innovate and include an Innovate DB Wideband Gauge, water temp and boost gauge all installed into a DDM Works gauge panel. The Base Line dyno for the stock 1.6L we had was from an earlier dyno run and did not match up to our current dyno charts. However, the power readings on the chart are what we would have expected from a stock 1.6L engine. Our standard setup uses the 85 mm pulley and produces 205 RWHP at 12 PSI. This power delivery will be easy on the drive train and reliable as any other component on your car. Our upgrade boost uses the 80 mm pulley that produces 215 RWHP at 13 PSI. For the occasional track day, keep the boost lower for reliability. Compared to the ’92 1.6L engine, we saw an increase of 17 HP with the 94-97 1.8L engine. 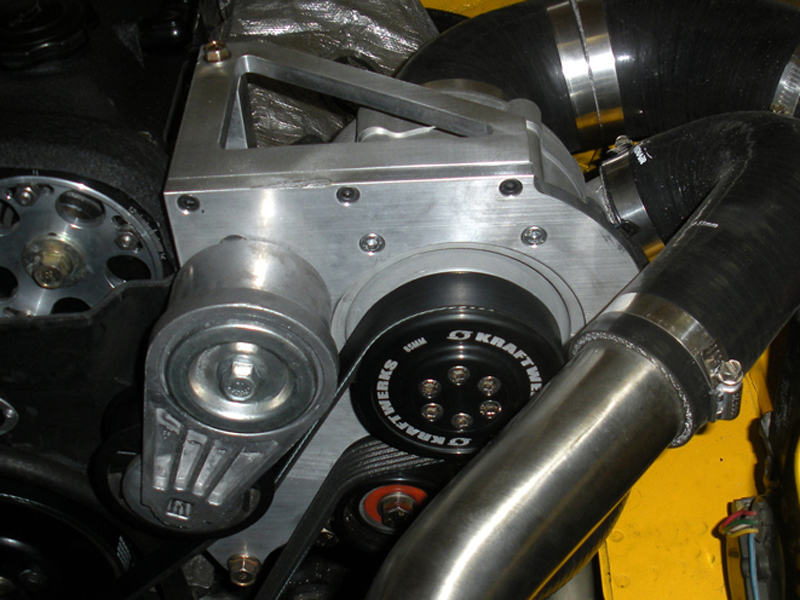 Our standard setup uses the 85 mm pulley and produces 222 RWHP at 11 PSI. This power delivery will be easy on the drive train and reliable as any other component on your car. 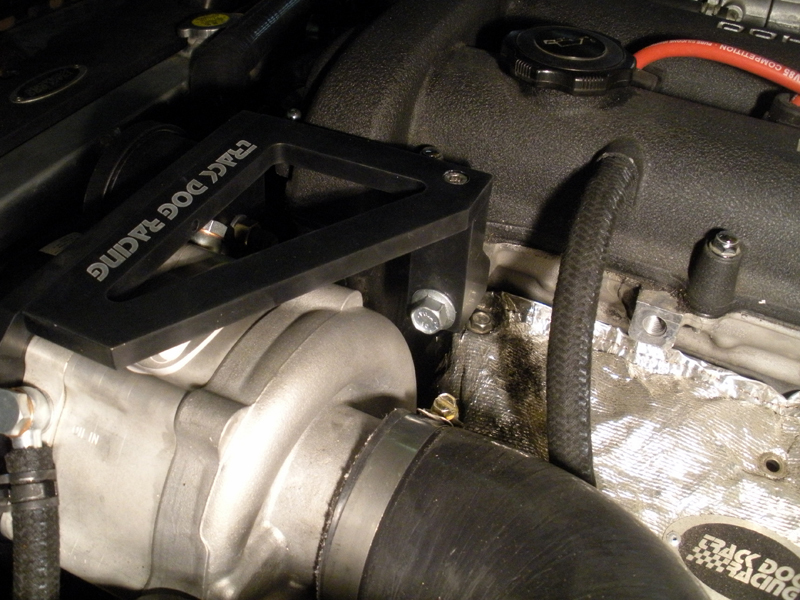 Our upgrade boost uses the 80 mm pulley that produces 230 RWHP at 13 PSI. For the occasional track day, keep the boost lower for reliability. The third chart is from a customer’s 1999 with 25k on the original motor. The exhaust uses a Racing Beat header, RoadsterSport federal mid-pipe and Racing Beat muffler. Clutch is our Spec Stage 2+ clutch and aluminum flywheel. Fuel and timing management uses our piggy-back TDR PNP Fuel and Timing Card with Deatch Werks 335 injectors on 93 octane pump gas. It has a completely functional A/C system and does not have any idle issues compared to the older style supercharger kits. Power delivery is linear, increasing with every RPM all the way to redline. The 99-00 models have a better breathing head than the 94-97 model. 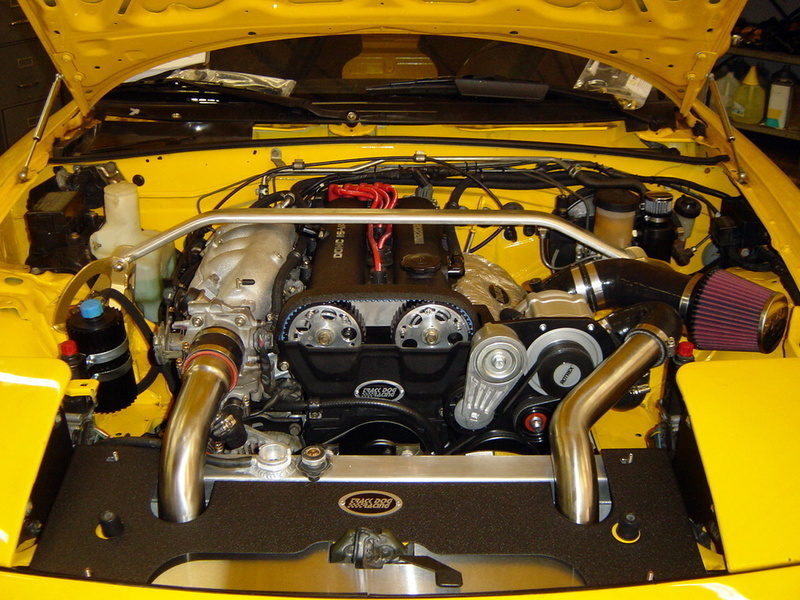 With the same pulley arrangement, the 99-00 model had an additional 17 HP with 1 PSI lower boost. For this reason, we use the 99-00 engine in our fully built high horsepower setups. For gauges we are using a single A-Pillar gauge pod with an Innovate PSB-1 Boost and Air Fuel Gauge. This is a good way to use one gauge opening with two functions. Compared to the ’94-97 1.8L engine, we saw an increase of 17 HP with the ‘99-00 1.8L engine. 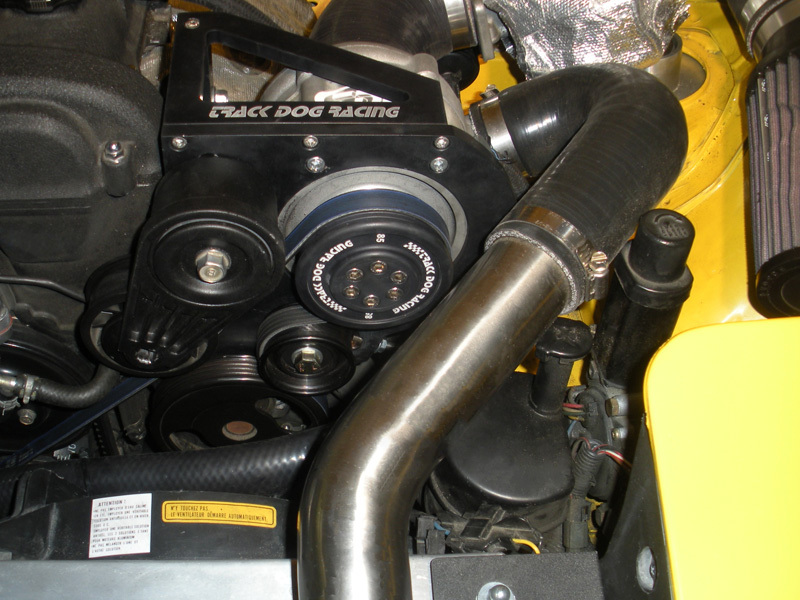 Our standard setup uses the 80 mm pulley and produces 239 RWHP at 10 PSI. This power delivery will be easy on the drive train and reliable as any other component on your car. 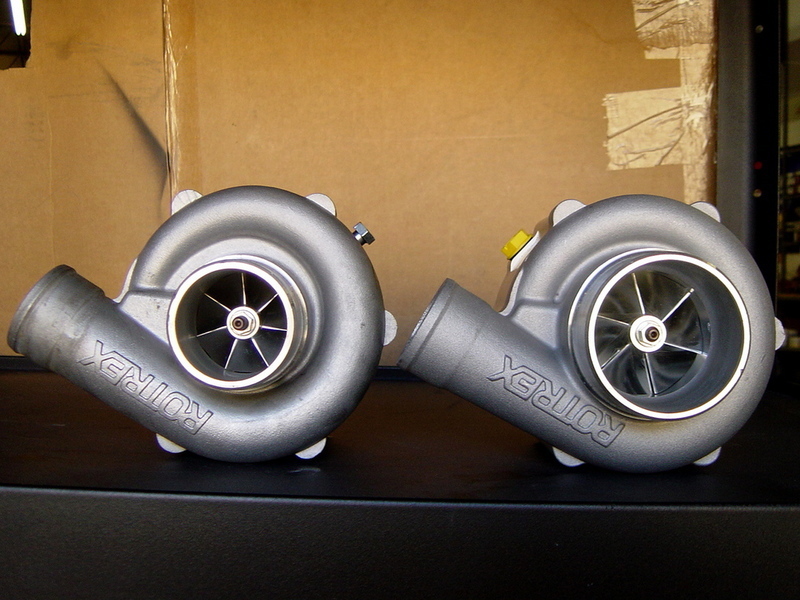 Our upgrade boost uses the 75 mm pulley that produces 249 RWHP at 11 PSI. For the occasional track day, keep the boost lower for reliability. 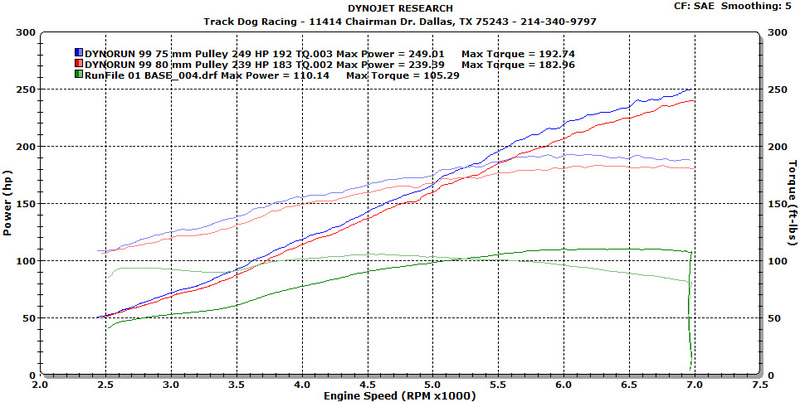 On all the dyno charts you'll notice a nice linear HP and Torque curve that pulls straight to red line. I know it's been a long time coming, but we want it to be right the first time. We've strived for perfection and I think we've come very close. All the reliability and ease of use you are used to but with a lot more HP! 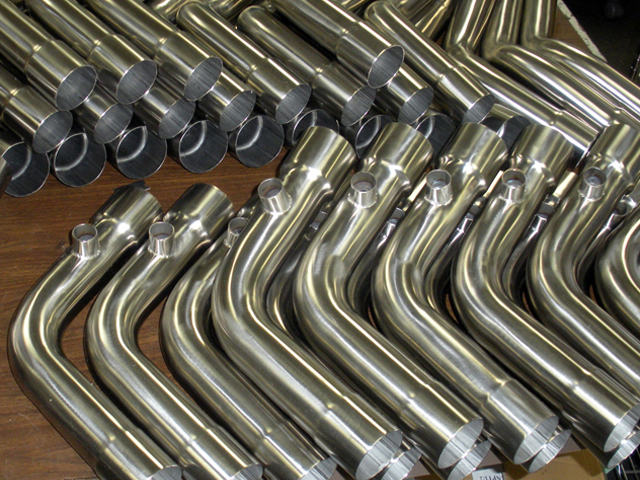 We are redesigning two of the supercharger inlet silicone hoses that are going into production now. When these are available we will be complete with the kit and the instructions. We appreciate your patience, but good things come to those who wait. Turbo power is so yesterday! once we find the ideal injector size. Here is another cool little thing. Our extremely thorough instructions will be installed on these TDR USB Drives and supplied with every kit. We are also gathering all the parts for the release. Here are some of the items we've been gathering up. We are disappointed on how long it has taking to release our kit. We have had several in service for 2 years now so we are complete on the build. The holdup has been the instructions which we are very thorough and want to be right the first time. Also we are making a change in the injectors and waiting for our next samples to come in to test. Our supplier changed the injectors on us and we did not notice this until we were having idle issues. We have a few sets coming end the end of this week to test. We have a 99 and a 94 car in the shop awaiting the injectors and then I think we are complete. Finger crossed! Perfection takes too much time. As we have said before, we are already installing these kits locally. We have a 99 Miata that was shipped to us from the Northeast that we are using right now to check our instructions. We've found several errors because you catch things while working on it that aren't as obvious when just proof reading the instructions. Now we are concerned about the 90-97 instructions and have a customer lined up right after we finish this install to test those instructions out as well. Why are we being so nitpicky? Well for one, liability. 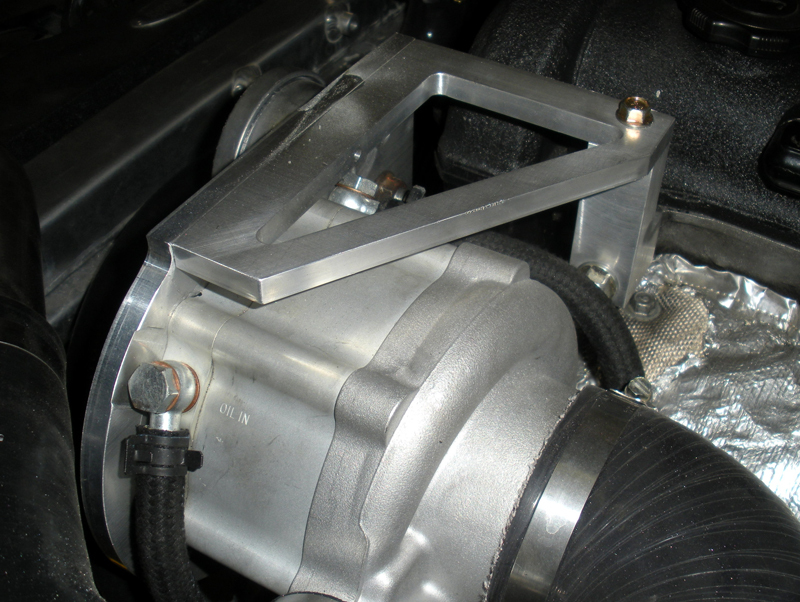 This is the first supercharger kit we have developed from scratch. The other kits were from Moss. As this will be "our" kit we want to be assured we don't have anything in the instructions or not in the instructions that could cause someone to damage their engine. To put it in more simplified terms, we want to make it idiot proof. This is much harder than it sounds and once these instructions are complete, they should be so thorough that anyone who can read English could install it. Nitpicky takes a lot of time. 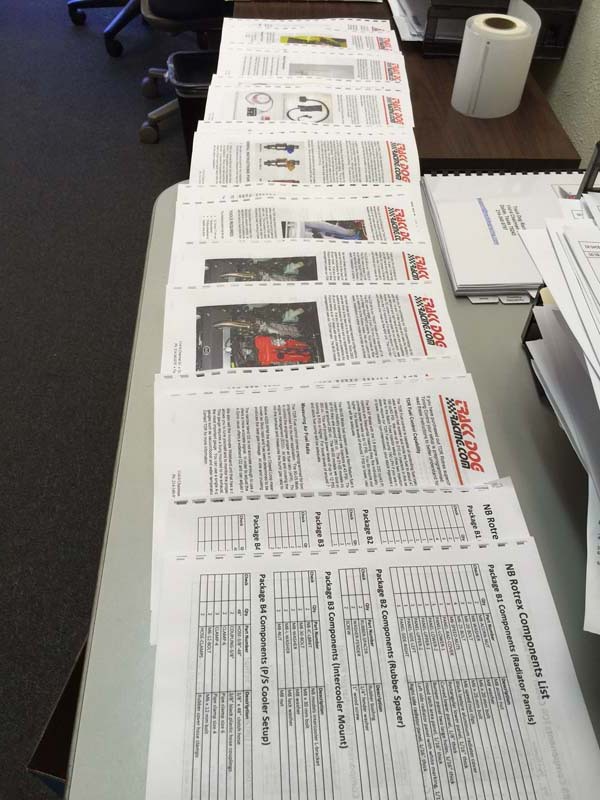 Each set of instructions is about 80-90 pages at last count. They include full color photos for every step. 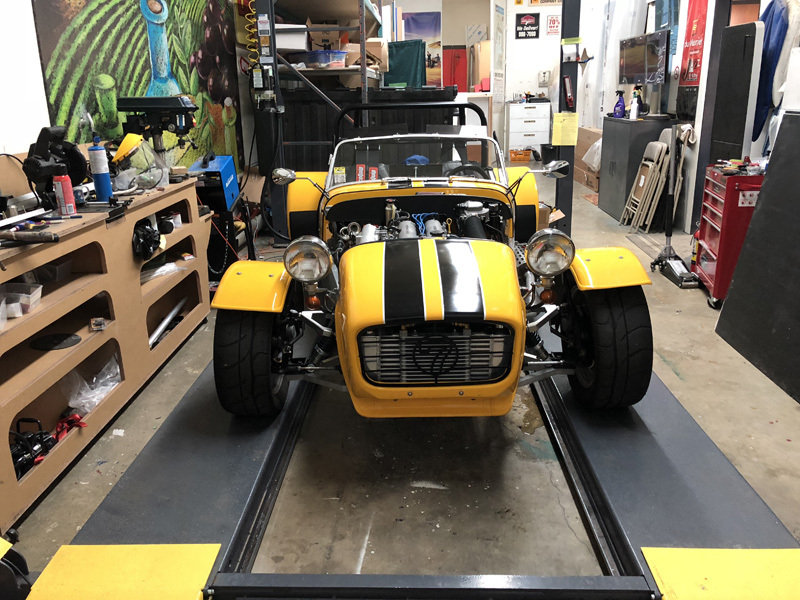 We have expanded the instructions to include how to install and program our fuel and timing cards, How to install the intercooler, remote oil cooler, injectors, the fuel pump, etc As I said, they will be thorough with nothing left to the imagination. So, now to answer the question about how little updates there have been. TDR is a small operation, four employees. We have an owner, a Office Manager, a Shop Manager and a Mechanic. We have a full service Miata shop that stays constantly busy serving the needs of Miata owners in the Dallas/Fort Worth area. We also have an ecommerce website that sells and ships all over the world. There's inventory, billing, parts production and the other daily duties of running a small company. On top of sales and tech support calls (which we love taking) and the occasional walk-in customer (which we also enjoy!) we stay pretty busy. This has been taking much longer than expected and for that we apologize. We just want to make the kit perfect as our customers have come to expect and this takes time. 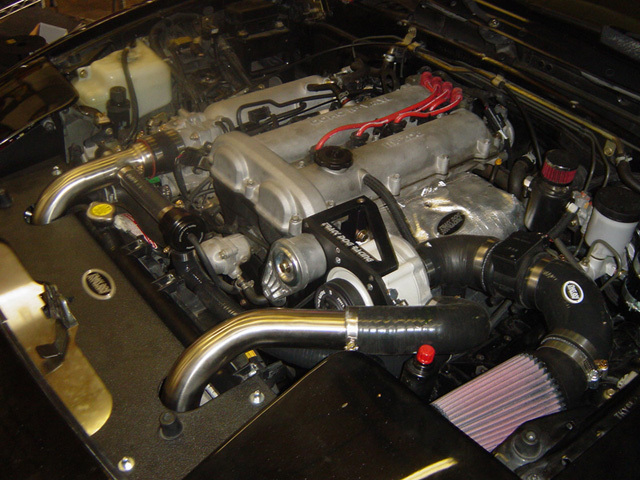 When we designed our intercooler, TDR was a small operation run out of Gary's garage. Years later, we have grown and the day to day operations have taken time away from development as well. The most time consuming part are the instructions. We want to make the instructions easy enough for even a novice home mechanic to install. This requires taking photos, taking more photos, editing the photos for size and format, writing step by step instuctions and trying to explain ever step so as to not confuse anyone. We often have to go back to get more photos as we realize something may not be clear to the end user. We know these cars inside and out. It's easy to skip steps that are obvious to us but may not be as obvious to someone new to the Miata or to working on cars in general. We have also been testing the setup on both the street and the track and results have been fantastic. "Woodstock" is our 92 Yellow with stock 1.6 motor running our street setup with the TDR Fuel Card. Daily reliability has been fantastic with no idle issues even when running the A/C in the Texas heat. 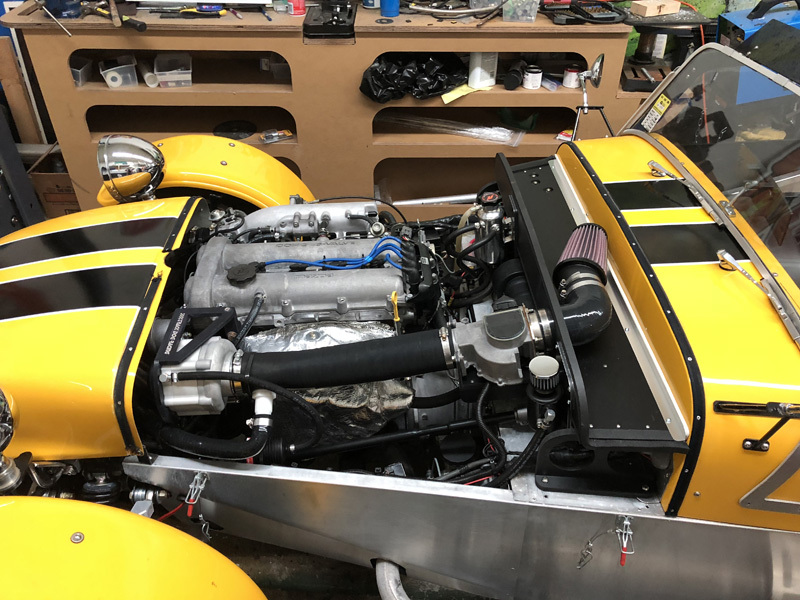 "Big Bird", our 96 Yellow with the beastly motor and C30-94 Rotrex supercharger using MegaSquirt PnP2 and the M-Tuned Coolant Reroute Kit has been faultless at several track events. As of this posting, the 90-97 instructions are 90% complete. The 99-05 instructions are about halfway done but we expect much of the 90-97 instructions will transfer over. We can install a kit today for local customers and we have. The hold up has been instructions since any kit we sell online will need them. Below is a photo of a local install on a 96 with stock motor. Starting price range will be around the $4200 range with intercooler. We plan to reveal both cars at the Texas Miata Round-up at Eaglaes Canyon Raceway on October 24th, 2014. We will provide rides and drives to potential customers so you can see first hand how great this kit is. We hope to see you there. If not, please know the kit is coming soon! We appreciate your patience as we finalize the details. 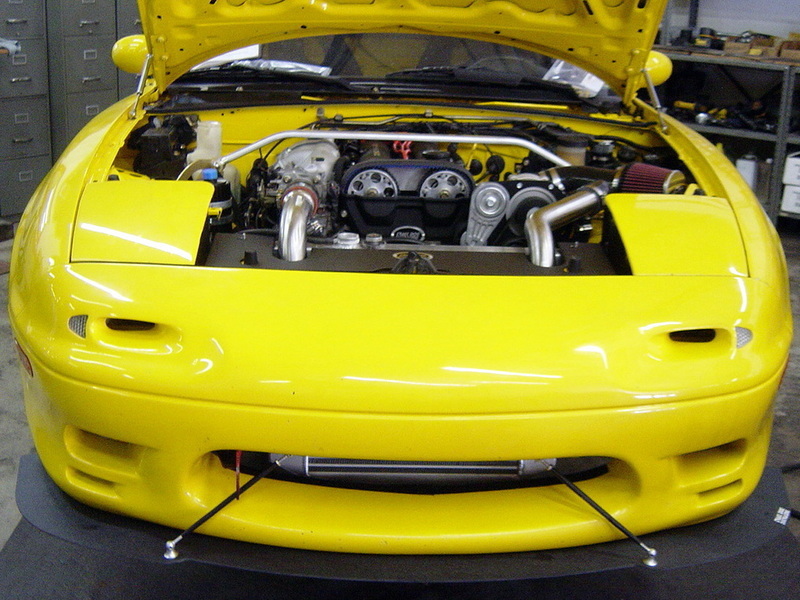 Sorry for the delay but we have been busy working with the kit on some NA and NB Miata to finalize fitment with our new brackets and also working with our various vendors to make sure everything we are replicating is correct. We are working on thorough instructions with photos and waiting for some custom formed silicone hoses for the kit. We are closer than ever folks and appreciate your patience. Here are some more photos to give you a sneal peak and our close to final design. Here is the new bracket unfinished. You'll notice the reinforcing bracket at the top. Here is another photo of the reinforced bracket. It ties into the location of the factory engine hook so it's a strong location. Here you can see the final design. Notice the flush hardware. You can also see our TDR pulley. We will be offering different pulley sizes customizable with your kit purchase. Most likely the standard pulley will be 85mm (Shown) which is around 10-12lbs of boost depending on the application. We decided to black-out the tensioner as well because it stood out like a sore thumb. Here is another photo of the reinforcing bracket with the black anodized finish. To the driver's side of the intercooler we have an air duct. 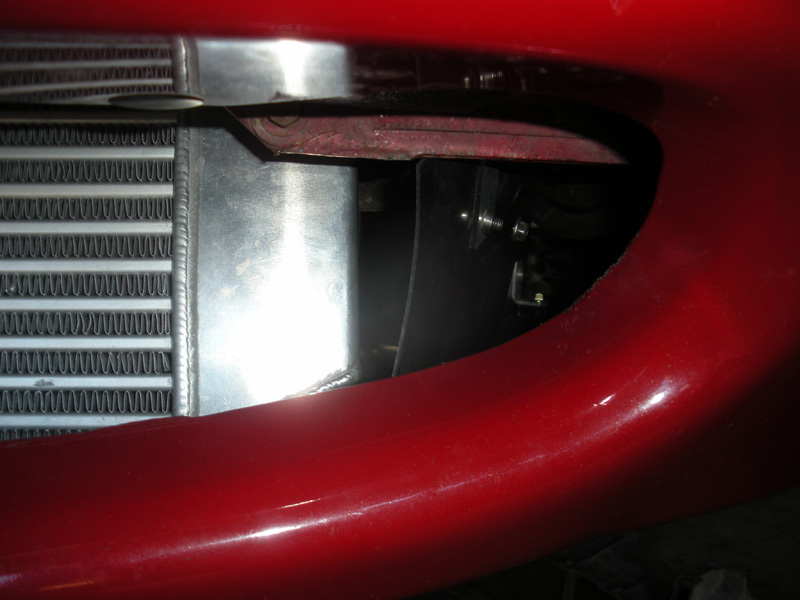 Upon closer inspection the duct directs air into the Rotex oil cooler. 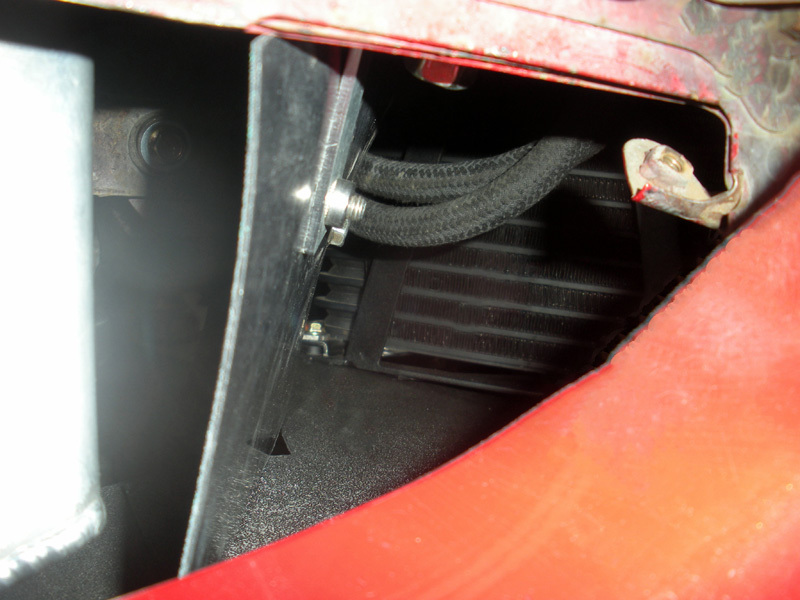 Here you can see our larger oil cooler for the Rotrex unit. This will be standard with our kit. Since we relocated the Rotrex oil cooler to the exhaust side, we are using shorter lines. 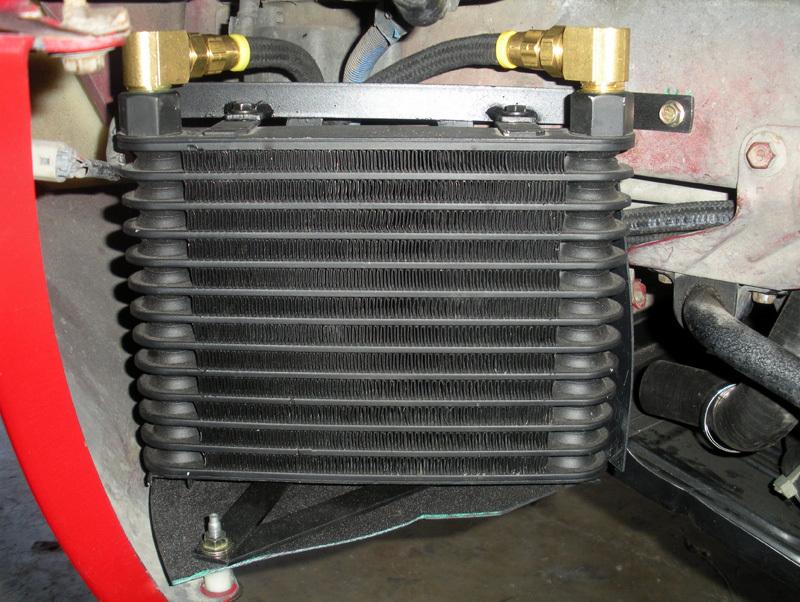 This means we are able to use a more efficient and larger capacity oil cooler. So this is where we are. We are waiting to get our custom silicone hoses and have to finalize our instructions. We will be offering everything a la cart so it can work with items you may already have. For example, engine management will be optional. If you already have a MegaSquirt or another engine management application, our kit will be able to work with what you have. We will also offer our TDR Fuel Card or Megasquirt as options. We will be able to work with each individual customer to design a system that fits their needs. 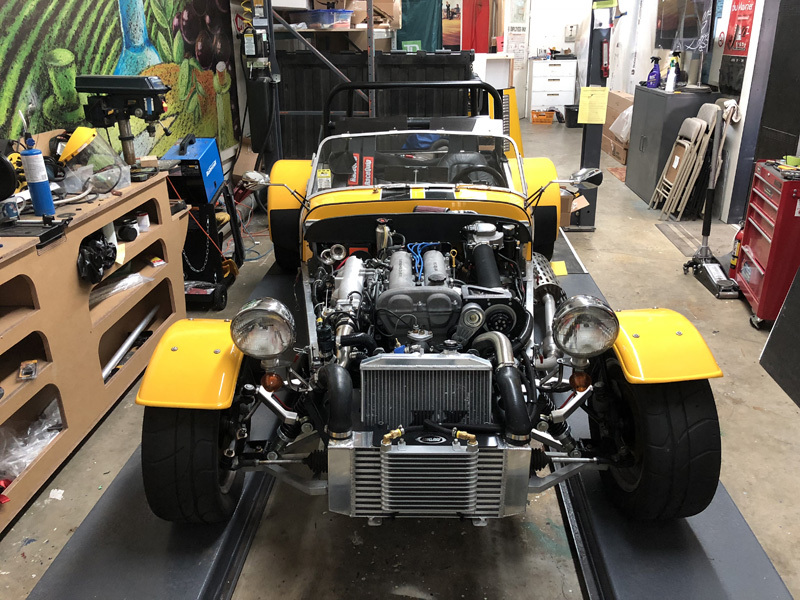 We have another R & D setup on a 92 1.6 Miata and been putting in some miles to see if we have any issues to address and good news is, we did it right the first time! As we mentioned earlier, we have decided to make our own SC mount and this weekend we are installing the first machined part to check for alignment. We are beefing up our mount with a large upper mount and an optional P/S delete replacement support. 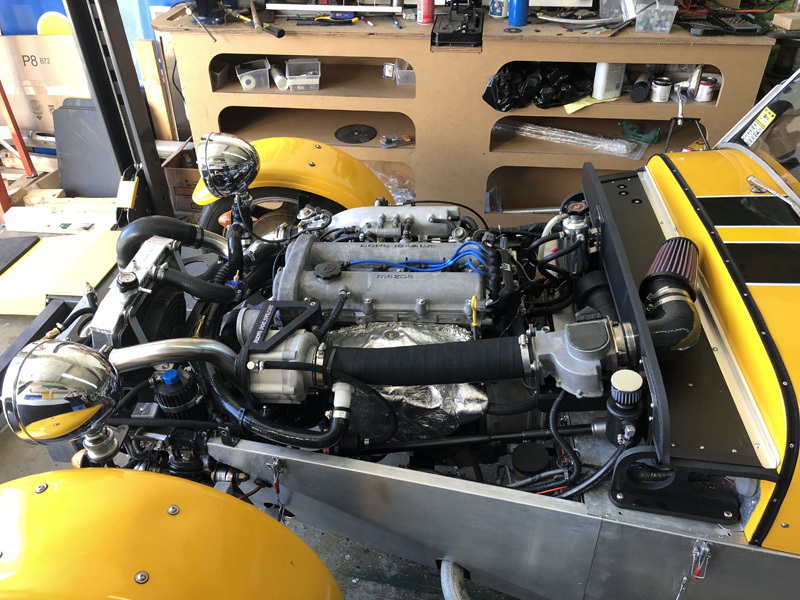 A lot of our customers are track day customers and do not use P/S or A/C so we are designing the setup to work with both the 4-rib and the 6-rib configuration. 4-rib setups are able to work with or without P/S and A/C. We made a lower crank pulley for the 6-rib setup. The SC has an 8-rib pulley so that works in both 4 and 6-rib applications. 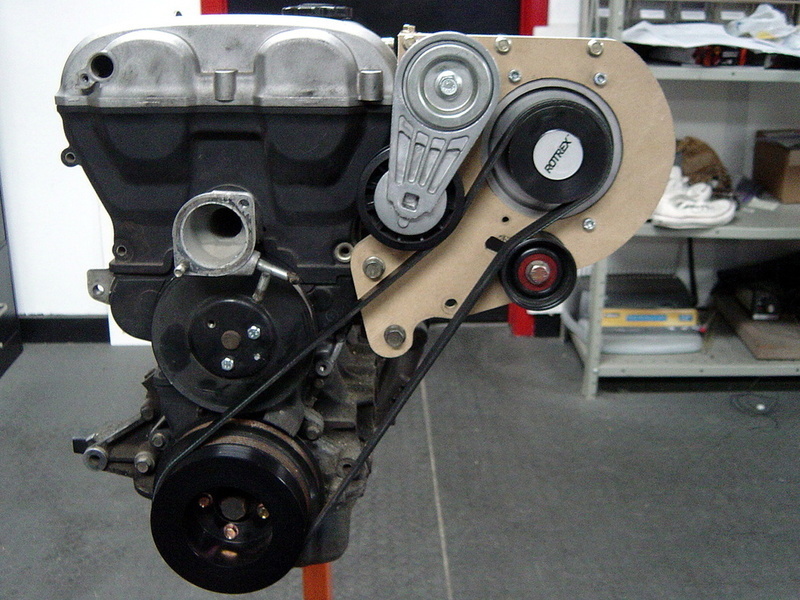 To convert to the 6-rib you would need to eliminate the P/S and A/C and add the crank pulley. Our plan is to write up instructions, the time consuming part starting in about 2 weeks. We can sell a kit today, we just don’t have complete instructions. However, you really don’t need a lot of paperwork to install the kit. We will use the Skunk mount if a kit was ordered today. All of the other components are our design. Driving impressions: This setup is like driving a stock factory car, it starts and idles normal, A/C idles normal and just has more power all the way to redline. Here is what we estimate for different STREET models running around 10 PSI. We are developing our own TDR ROTREX Supercharger System with three levels, Base, Street and Track and will be available for all 90-05 Miatas. We will include TDR electronic fuel card and timing card for low to mid boost levels on the Base and Street levels. Higher boost and track applications will use optional fuel and timing management like the Mega Squirt for 90-00 Miatas or Greddy Emanage for 01-05 Miatas and or if you need to keep it OBDII emissions compliant. There are no plans for CARB certification. Any kit can be upgraded as you go. The TDR I/C will be included in the Street and Track versions and can be used for both street and track applications. The Track version uses the C30-94 Rotrex. 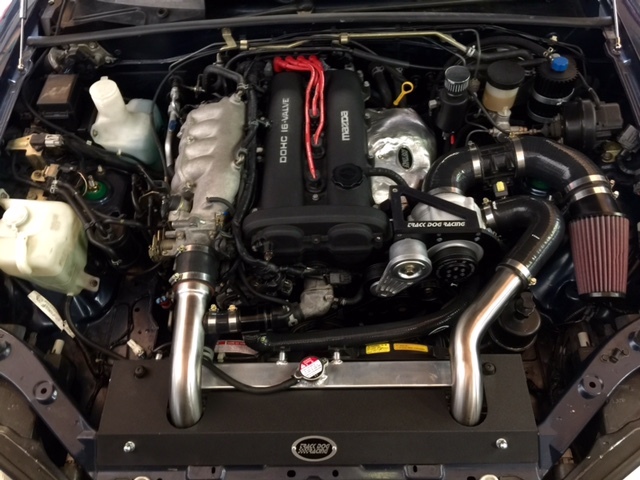 Our 96R with this S/C has around 320 RWHP at 19 PSI. We use Mega Squirt for fuel management. This option requires a built motor which we can also provide. The Base and Street will be using the smaller C30-74 Rotrex unit. This unit was capable of 225 RWHP at 12 PSI on a 99-00 model we did a while back. We are not far off on having our kit, but we need to take more pictures and write up the installation instructions. We are also in the process of developing our own S/C mounting system. Our new TDR S/C mount uses a 4-rib setup for the Base and Street option and allows for P/S and A/C. The same bracket also uses a 6-rib for the Track option if P/S and A/C are eliminated. This will also require a TDR 6-rib crank pulley. We wish it was not taking so long to develop, but good things come to those who wait. We are finishing up our brackets for the oil cooler which will be behind the front bumper on the driver’s side, oil reservoir bracket and our own heavy-duty SC mount. The kit is not going to be difficult to install. Drivability will be good with good idle control even with A/C. We expect the Base setup will be around $3300. The Street option, around $4600. The Track version will likely come in less at around $4300 but will not include fuel management or injectors. All these kits will bring worthwhile improvements along with the outstanding quality you expect from us. You can also see our new Radical Splitter for the Racing Beat Type II Nose. Two different Rotrex units will be available depending on your desired power level. The C30-74 for the Base and Street versions is on the left and the C30-94 for the Track version is on the right. 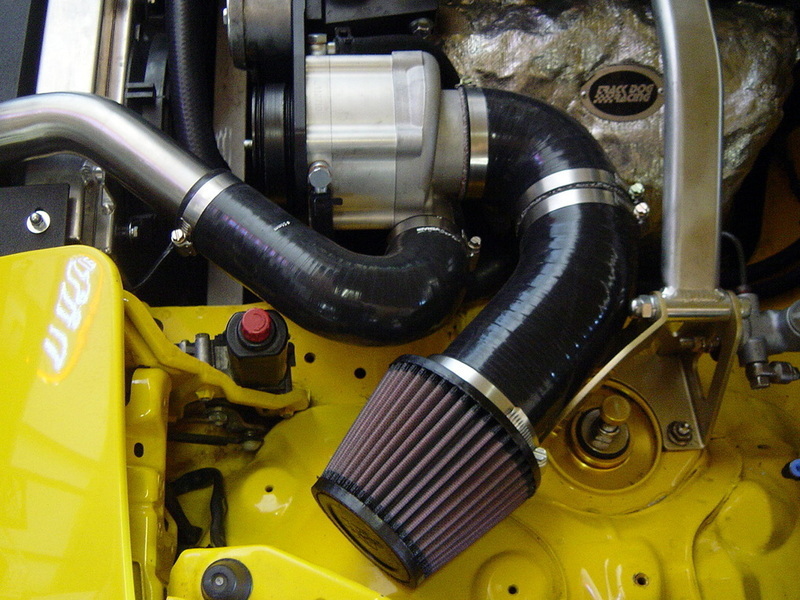 Free Flow K&N Intake with heat resistant silicone tubing will be standard. Close up of our mock-up S/C bracket. It will have additional bracing for durability and strength. 6-Rib Track version will be an option with power steering and A/C delete.